Reporter, InsideClimate News, based in Louisville, KY, since May 2018. Covering the South as part of ICN's National Environmental Reporting Network. May 2018 - present. Senior Reporter, The Courier-Journal, courier-journal.com, the USA Today Network, Louisville, KY, 1999 - 2018. Daily and project reporting on environmental issues and agencies in Kentucky and Indiana for Kentucky’s largest news organization. Broke national story on brain-damaged railroad workers. Uncovered toxic-air levels in Louisville that were among the highest in the U.S., prompting crackdown. Investigated the performance of regulators and agencies, including mismanagement at the Louisville Metropolitan Sewer District, prompting a state audit and overhaul of board and executive leadership. 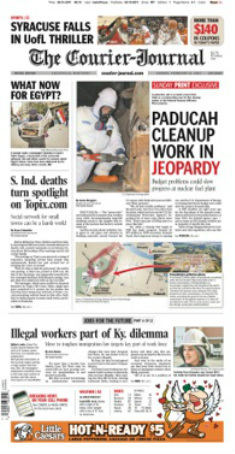 Extensive coverage of coal, energy, chemical plants, business community and legislature. Established Watchdog Earth blog in 2006. Excelled at digital-first strategy and audience development for desktop, tablet and mobile platforms through metrics, social media, and brand building. Staff writer, Contra Costa Times and Contra Costa Newspapers, now East Bay Times; Walnut Creek, CA, 1988-1999. Promoted to full-time environment beat in 1992 after four years of covering local government, health care and part-time environmental reporting. Daily and project reporting on issues including nuclear waste, timber wars, water, endangered species, the ocean, state and national parks, water pollution, and growth. Chronicled public land purchases with four-day backpacking trip through suburban wildlands. Broke stories on leaking military fuel tanks and a polluting mercury mine. Wrote column. Correspondent at USA TODAY (2008-2009), where I contributed to award-winning “Smokestack Effect” series; reporter at The (Vancouver) Columbian, Vancouver, WA (1987-88); Hungry Horse News and Whitefish Pilot, Montana (1983-84); Frontiersman and Valley Sun, Alaska; and Missoula correspondent (1984-85), Great Falls Tribune, Great Falls, MT (1985-87). Board member, Society of Environmental Journalists, 1997 to 2010. SEJ President 2000-2002; vice president in 1998-2000. As SEJ president, I supervised the executive director; managed a 15-member board of directors; launched a Freedom of Information Task Force that works with other journalism groups to raise awareness of and speak to First Amendment threats; oversaw establishment of a national awards program, and an endowment. During 13-year tenure, I helped SEJ raise hundreds of thousands of dollars and helped negotiate financial agreements with several universities to host SEJ’s annual conferences. Co-chair, SEJ annual week-long conference in 2010 with more 850 registrants. Worked with SEJ staff to coordinate dozens of volunteers. Helped to organize and oversee a program of more than 200 speakers that included eight day-long reporting tours; two day-long workshops; a summit of U.S. and international journalists; 30 concurrent panel discussions; and four plenary sessions. SEJ Awards Committee co-chair, 2015-2017. Organized SEJ conference in California on covering water policy, June 1998; co-organized a regional conference on covering environmental justice, 2000. Board of advisors, Institutes for Journalism and Natural Resources, 1998 to 2013. Guest speaker at University of Louisville, Western Kentucky University, and Bellarmine University, 2014, 2015, 2016. Visiting lecturer, Central Michigan University, March 2003. Speaker at SEJ, Society of Professional Journalists, Investigative Reporters and Editors, and National Institute for Computer Assisted Reporting conferences, various, 1997 to present. Guest speaker, Michigan State University, 2002; guest speaker at Carnegie Mellon University 2005 science media boot camp. Guest speaker at Spalding University, Louisville, on several occasions, 2005-2009; guest speaker, University of Cincinnati journalism department, 2009. Occasional guest on Kentucky Educational Television “Comment on Kentucky” show, and Louisville Public Media news radio station, WFPL. 2016. Best general news story, first place; best ongoing coverage, first place; best column, third place, Kentucky Press Association. 2016. Environmental reporting, first place, Louisville SPJ. 2015. Business reporting, first place; continuing coverage, Louisville SPJ. 2013. Large-market, beat category, honorable mention, SEJ Awards for Reporting on the Environment international competition. First Place, Louisville SPJ, for enterprise reporting. 2005. Science Journalism Fellowship, Marine Biological Lab, Woods Hole, MA; Toolik Lake, AK. 2004. Thomas Stokes award from National Press Foundation, best environmental coverage. Best of Gannett awards, first place, beat reporting and individual achievement; contributed to Best of Gannet FOIA award. First place, Renewable Natural Resources Foundation’s Excellence in Journalism Award. 2002. APME top-ten finalist, public service. 2002. SPJ Louisville Chapter award for best business reporting. 1998-99. Knight-Wallace Journalism Fellow, University of Michigan, Ann Arbor. 1997. Acadian Institute fellowship, Bar Harbor, ME. 1996. First Place, California Newspaper Publishers Association, and second place, Best of the West, for team report on water/economics. 1988-1997. Thirteen East Bay Press Club awards; best beat coverage five times; first place, agricultural reporting in California, California Polytechnic Institute. University of Montana, M.S., Environmental Studies, 1987; journalism and forestry double major; 1981. Investigations, interviewing, data collection and analysis, writing, editing, critical thinking, public speaking, working in teams, leadership, volunteer development, fund-raising, non-profit organizational management, event planning and execution, photography, video, social media, and blogging. Experience with both Apple and Microsoft operating systems. Engineering technician, Alaska; agricultural intern, Somalia; furniture mover, Michigan and Alaska; Christmas tree pruner, Michigan.